We created this punch box to use for the Candy Button Trivia game we played at our Maddie-licious party. It’s pretty easy but does take a little bit of time. First, start cutting circles on your poster board. We set our circle cutter to 5 inches. This let us make three columns of three circles each per poster board. You can choose to make smaller or larger circles. Your poster board will look like this after you’ve finished. Repeat the process on the second poster board. Now start cutting out the tissue paper and gluing the squares over each circle. We cut ours into 6×6 inch squares as our circles were 5 inches. We recommend cutting individual squares since punching out one hole may pull the paper off the others. 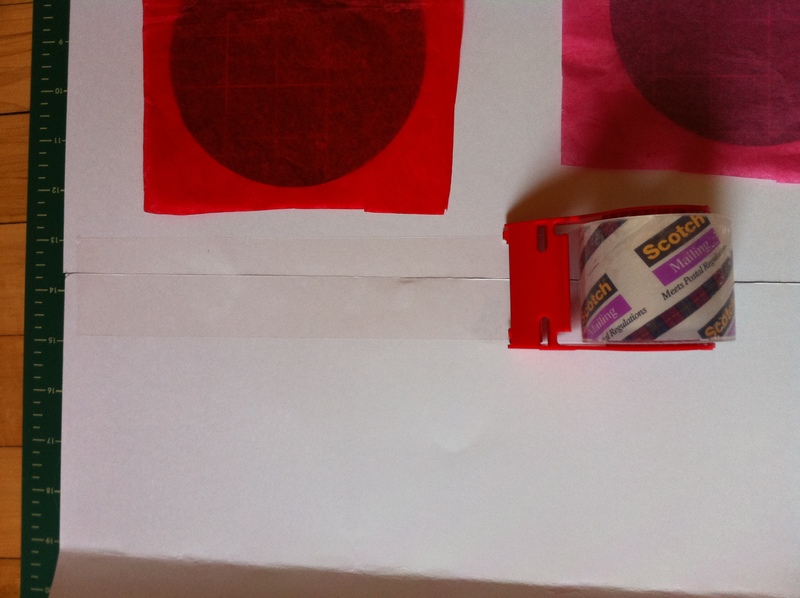 Once you have all the circles covered, tape them together to form one long strip. You should then have something that looks like this. Next, take the remaining two poster boards and cut them in half length-wise. Then fold each piece in half length. These will be the side panels of the punch box. Lay the smooth side of the poster board (the edge you didn’t cut) next to the poster board with the cut-outs. Line up the top edges and tape together. Next, take your lunch bags and cut off the top 6 inches. (We saved the tops and made small snack bags by gluing and folding the bottoms shut.) Take the bottom half of the bag and start making 1 inch cuts along the top and then fold them over. These tabs will be what you use to tape them down. Repeat with all the bags. Lay out the board and place a prize on each circle so the prizes are evenly distributed. Then cover each one with a paper bag and tape down. Once all the bags are attached, fold over the side panels to cover the bags. You may have to tape the side panels together across the back. Thread some ribbon across the top, hang it up and you are ready to go! Did you have a game to play with this? Or did everyone just get a turn to break one open? I love this idea! It makes me think of the Price Is Right! We used it to play a candy-themed trivia game. Everyone answered a question and got to pick a “button” to punch. Funny, my husband and I just made a very similar game, but it was out of a large flat cardboard box that lay on the floor. He segmented it into little squares with cardboard, each square got a prize, then we did an overlay of paper. It was for my son’s third birthday–pirate themed. The kids went on a treasure hunt that ended for them “digging” a prize out. This is a great idea, too! Really fun project, and I love the idea of making an advent calender, or a countdown to any special day. I’m really wishing I had that tool to cut out big circles! I need to make this by Saturday for my son’s second birthday. The polka dots will go GREAT with our Hungry Little Caterpillar theme! It’s the Martha Stewart circle cutter available at Michael’s. So handy! I just made one, and found a small bowl to trace, then cut the circles with exacto knife and it was easy & quick. Making for my 9yr olds sleep over. I think they’ll love it! I had so much fun making this! It was very easy to follow. My advice is to make sure you have at least 3 FULL rolls of scotch tape- i ran out. The Kids are excited to tear it up!! I recommend having the kids earn tickets and then 5 tickets=1punch if they do something good or are quiet they will get a ticket or play a game and earn tickets!!!! Great idea! I wish I’d seen this before my daughter’s party last week! 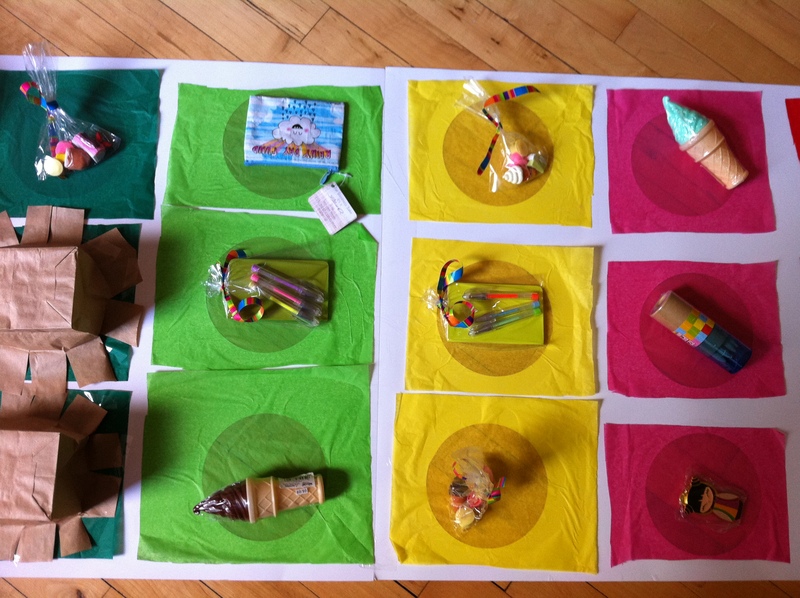 This is such an amazing idea – just finished assembling ours for a party on Saturday. We had a giant cardboard box, so I glued the cardstock to that, and then cut through the cardstock and cardboard – it stands on its own! The stand-alone idea is great! We’d love to see a picture. I used this idea as a classroom management tool right before Christmas. I created a Christmas tree instead of the straight panel, and instead of “candy” themed prizes, the circle pouches were filled with reward ideas for the kids and good behavior. It was fun, and thanks for the great idea! I used this for my daughters rainbow 4th birthday party. The kids LOVED to punch their prize as they left the party. The parents were pretty impressed as well. Thank you for the tutorial! Thanks so much for this! We had one for our daughters’ 2nd and 4th birthday party this past weekend. It was a Christmas theme, so we did Christmas trivia to go with it. The kids LOVED it, and it was so nice to have a party where a kid or two wasn’t in tears after being trampled going for the pinata prizes!! What a great idea! We’d love to see pictures of the finished game. Wonder if it would be a bit easier to glue rather than tape? Absolutely! We just ended up using tape because we were worried that some of our heavier prizes wouldn’t stay put with from the game being hung up and the movement from the poking. Oh my gosh!! I love this!! I would totally feel like being on Price is Right!! So much fun! Thanks for sharing!! Here are some sites where we pulled some of our questions. We also changed the format of the harder ones into multiple choice to make it easier for younger guests. Thank you, I love this idea! I was looking for something besides a pinata that they could get a prize, but was easy, since they’re in Kindergarten. Yeah!! Brilliant. I just saw someone else share a tutorial…inspired by your tutorial. Sometimes, though, there is no reason to reinvent the wheel when it was done so perfectly the first time. Your tutorial is AMAZING. I am pinning this and hope to be ambitious enough to try this for my daughter’s birthday party. i love it, im considering using this as a idea for a prize picker instead of lucky dip for my party in september… thanks! Thanks for the great idea!!!! 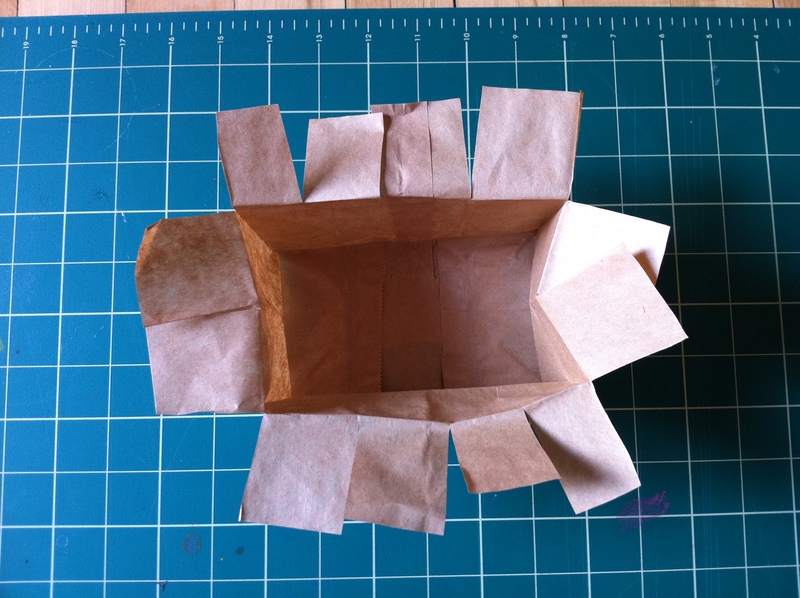 I need squares instead of circles and I’m thinking about using square Kleenex boxes instead of bags… Can’t wait! What a great idea to use Kleenex boxes! Cute idea with the paper! We are having a 5th birthday party for my daughter this weekend, which is candy themed. I followed the directions and it looks like Dot candy! We are going to play basically “hot potato”, but with a small hershey’s kiss pillow. Whoever ends up with the “kiss” is whose gift my daughter will open and then that child will get to punch out their prize! Can’t wait! Thanks for the idea! Just wondering how the ribbon held it?? Cute idea! A ribbon was threaded through two holes on each side and taped to the box on the inside with packing tape. The tape reinforced the holes and kept the ribbon from pulling too much. It stayed up from the beginning of the party until the very end. i really love this idea to get everyone involved…. Making one now with train cars instead of circles for my son’s train-themed party on Sunday. Thanks for the idea! I made this for my daughter’s 15th birthday party. The theme was candy and balloons. I made this board, and instead of putting prizes in the bags, I put slips of paper with point values, and some holes had point values and a bonus punch again tickets. I made up a candy trivia game. The kids loved it.. I made this for my daughters 4th birthday this past weekend. The little ones loved this! I think it was more exciting for them than a regular pinata. Thank you so much for the idea and tutorial 🙂 We are using it as an incentive to potty train our 3 year old! So far, so good!! I’ve even punched out a few after using the potty. The bonus is you have to wash and DRY your hands, which he never does because he is always in a rush to get his reward. Love it! What a great idea! Hadn’t thought of using it as an incentive. How heavy can the stuff be thats inside??? I just have little bags of candy but i’m nervous to set it up a few weeks in advance b/c i dont want it to rip or break! It depends on the kind and amount of tape you use. I used packing tape and it held some pretty heavy items. WOW! SO fun. I’m having a cupcake party for my 12 year old girl, and we are going to make the holes shaped like cupcakes with a light pink board instead of white. Thanks for the inspiration! It took me a little over an hour (hour and a half max). I’m using this idea for my daughter’s candyland carnival birthday party! The board looks like a strip of “candy dots” candy. Thanks so much. This is awesome. I want to make this for my daughter’s bday party. THey are teen girls and I am thinking of color matching nail polish and a file to the color outside. Would the bags hold nail poilsh and a file? You may need a little extra tape, but it should hold nail polish and a file with no problems. Do you have any ideas on how to make it stand? I dont have anywhere to hang it up. LOL! You might try using foam core board for the sides and back of the punch box and just use poster board for the front. That might enough support to allow you to stand it up against a wall. Thanks! I was going to use cardboard along the back in a triangle shape to see if it will stand. I am using it at my sons 5th birthday instead of a piniata. This is the best game idea ever!! I’m going to make one to use in Sunday School this weekend with trivia questions. Thanks for the GREAT idea!! what are the dimensions? I love the idea!! Thanks! The circles are 5 1/2 inches across. I just used two 22×28 inch poster boards, so the game I made was 22×56. I making this for my son’s super hero party this weekend. we’re going to make it with squares instead of circles to make it look like windows on a building! I love this idea! I’m adapting it a bit to make a “pop the tire” game for my sons Hot Wheels party. Thanks for the pics and tutorial! Using it for my daughter’s Lego party using yellow poster board and yellow tissues to looke like giant Lego. Inserting slips of paper with “prize”, “punch again”, and various silly activities (sing happy birthday in a silly voice, dance Gangam style, do the crab walk the length of the room,etc). Thanks for the tutorial! Love the activities idea and the LEGO theme. How fun! I pinned this a long time ago and I just made one for a Candy Land Party. I used cardboard and solo cups instead of paper bags – slid them in through the front of the hole and then covered the hole with the tissue paper. I used the poster board with the same holes cut and hot glued on the front to cover where the tissue paper was taped on. Thanks for the great idea! Hi, I’m not exactly planning someone’s party- because MINE is coming up!!!!!!!! I’m eleven and on November 15th I’m gonna be twelve. I LOVE this idea, but do you think it would be okay for my age? Absolutely! I know most of the adults who saw the punch box wanted a turn, so I think it would be totally appropriate for your party. Happy early birthday! So cool. I’m thinking plastic gardening pots for the back….Or sticking a bunch of tissue boxes together. I love this idea! Planning my granddaughter’s 1st birthday…The theme is China since her name is Chyna….I just love unique ideas because the pinata is old…Thanks for sharing and explaining step by step how to do game….Counting down to party. Thanks for the great idea. I adapted this for a boys’ Ninja Halloween party last fall. I made Ninja faces from construction paper to cover the holes with little ninja figures from OT as prizes and had the boys practice their strike skills on the board as a Ninja training exercise. The boys went wild – the board (I used a cardboard trifold display board since it was slightly sturdier) was completely decimated by the end of the game! Pingback: Dollar Store Series- EET/describing vocabulary | letsbabbleon - A place where babbling is a good thing! Pingback: ABC End of the Year Countdown | My Attempts at Being Creative!